Workforce planners usually have two choices, first – they are able to get it done using employee schedule spreadsheets however it needs more time and another option – they may be able to use good quality employee scheduling or rostering software. Thankfully, SmartTask employee scheduling software has probably changed one of the most time-consuming managerial jobs into a productive activity, reducing the headaches and frustration of making and maintaining changes to the workforce roster while releasing up time for tackling much more lucrative, higher-priority jobs. SmartTask is a SAAS (software-as-a-service) cloud-based, all-in-one easy employee scheduling, time & attendance, tasking and communication solution. SmartTasks UI (user interface) makes group staff scheduling much easier and permits companies to target new businesses as opposed to upgrading spreadsheets. SmartTask is really intuitive, fast and easy to use with leading-edge features like intelligent rostering, customizable reporting and time features to help reduce tardiness and absenteeism. Using SmartTask’s full-featured, easy employee scheduling software, allows you plan scheduled shifts, enter time-off requests, add special annotations for days, months, and on occasion even years beforehand, then quickly create any schedule or report – It’s this that our clients love about our software. Scheduling workers enables you to automatically keep track of staff members hours to stop work and/or union legislation violations. So we have therefore gone all-in about this, working towards making SmartTask the number one choice to help employers organize the hours of staff members that work versatile schedules and making SmartTask a 100% mobile employee scheduling tool. No matter whether a member of staff works full-time or part-time, businesses reserve the ability to occasionally adjust the schedules to ensure they truly are in accordance with company requirements. Another important purpose of small business employee scheduling software is being able to combine data into easy-to-understand reports. From our sales team understanding our client requirements and having great ideas from customer review feedback, to our development group making consumer suggestions a real possibility, it’s not hard to observe that our clients are responsible for making SmartTask an ideal cloud-based staff scheduling software solution. View the SmartTask tutorial to provide you with a clear concept of how exactly to include your workers, positions, obligations and routine shifts. You can add staff members email address, approved work locations, skills, availability, and work hour constraints into the workers’ files. Works like an electronic whiteboard – just drag a shift and drop it onto a calendar to set up. 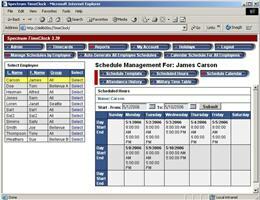 SmartTask’s cloud-based staff scheduling software keeps your workforce constantly up to date.